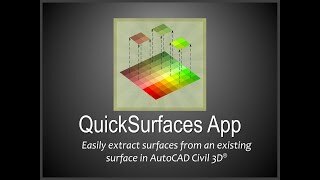 The QuickSurfaces plugin for Autodesk® AutoCAD® Civil 3D® provides an easy way to extract multiple “child” surfaces from an existing surface by selecting polylines that define their outer boundary. The plugin assigns the child surfaces a user-specified style and extracts terrain information, including mean slope, mean elevation, and minimum and maximum elevations. The user has the option to create child surfaces or just extract terrain information.